Preheat oven to 350 degrees. 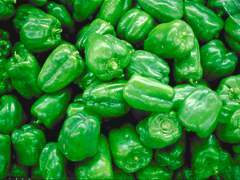 Clean bell peppers, remove veins and seeds. Prepare rice according to package directions. In large skillet, brown pork and onions. Cook meat until brown. Spoon off excess grease. Add tomato sauce and spices. Stir in cooked rice. Spray 8x8 pan with nonstick cooking spray. Place peppers upright in pan. Spoon meat mixture into peppers. Bake about 10 minutes. Enjoy! I remember my mom cooking stuffed bell peppers. But I have never eaten stuffed bell peppers with ground pork. I will have to try it using ground pork. By the way... I am new to this blog.